Singapore Airlines (SIA) is focusing on further expanding its partnership portfolio to provide a more comprehensive network and boost feed. New deals have been forged over the last six months with Air New Zealand, Asiana, EVA Air and Turkish Airlines as part of an ongoing initiative which is expected to generate more new or expanded partnerships by the end of 2014. SIA has already more than doubled its codeshare segments over the last three years as it has added eight new partners and strengthened several existing partnerships. The group is now negotiating several more new partnerships while seeking opportunities to improve connectivity with existing partners. In this analysis CAPA examines the increasingly important role partnerships are playing in SIA’s European, African and Middle Eastern networks. In a second part, to be published later this week, CAPA will focus on SIA’s need to rely more on partners to expand across the Americas. SIA now places its code on 5,000 weekly segments operated by 24 carriers. This excludes SIA full-service regional subsidiary SilkAir, which carries the SQ code on all of its flights. The number of weekly codeshare flights that SIA markets has more than doubled since the beginning of 2011 while the number of offline destinations has also grown by more than 50%. SIA now has more than 160 offline destinations. Partnerships have been a key part of the new SIA Group strategy under CEO Goh Choon Phong, who took over as group CEO at the beginning of 2011. Previously SIA was generally a reluctant partner, preferring to promote its own network, avoiding close relationships with most Star Alliance members and gaining a reputation for unattractive pro rates. SIA is still not as aggressive as some of its peers in pursuing partnerships and has not yet forged any large or game-changing partnerships such as Qantas-Emirates, but it has opened up considerably. Under Mr Goh, SIA has forged new partnerships with eight carriers: Virgin Australia (Jun-2011), Brussels Airlines (Jun-2011), Transaero (Jul-2011), Ethiopian Airlines (Oct-2011), Aegean Airlines (Nov-2012), Virgin America (Dec-2012) Shenzhen Airlines (May-2013) and EVA Air (Dec-2013). Mr Goh also has significantly expanded what were previously very limited partnerships with Star members Air New Zealand, Asiana, SAS and Turkish Airlines. The SAS partnership was expanded in 2012 to include a joint venture between Singapore and Copenhagen (as well as additional beyond codeshare points). Expansions with Air NZ, Asiana and Turkish were all forged in 1Q2014, with Air NZ becoming SIA’s second joint venture partner after SAS. Singapore competition authorities approved in Apr-2014 the SIA-Air NZ alliance, which includes revenue sharing on flights between New Zealand and Singapore with Air NZ also using SIA for connections within Southeast Asia, South Africa and continental Europe. Both of SIA’s joint ventures are relatively limited as SAS does not serve Singapore and Air NZ will only operate one flight to Singapore (starting Dec-2014). Both carriers are also relatively small. But the two joint ventures represent a strategic shift for SIA as they include revenue sharing. Virgin Australia is the biggest partnership forged by Mr Goh to date in terms of total number of codeshare sectors (see background information). But it is also a relatively small carrier that does not currently serve Singapore. The Virgin Australia deal was strategically important (so important SIA has also acquired a 20% stake in the carrier) as it addressed one of SIA’s biggest longstanding weaknesses – lack of a partner to help push sales and provide access to secondary destinations in its largest foreign market. SIA says codeshare traffic with Virgin Australia has been growing on both sides and the two carriers also have succeeded in using their partnership to increase their penetration of the corporate market. 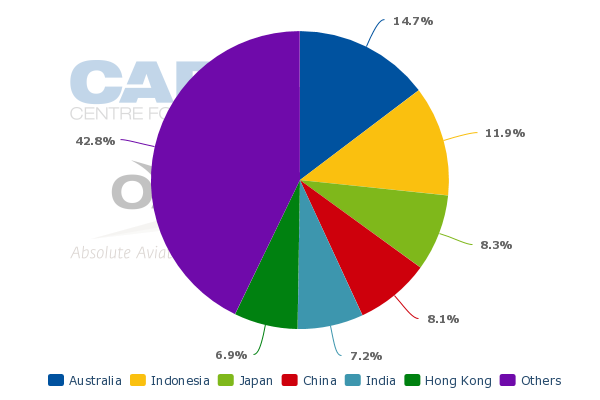 Australia accounts for about 15% of SIA capacity in terms of seats and about 18% in terms of ASKs, according to CAPA and OAG data. While not initially a joint venture, the newly expanded deal with Turkish has potentially big ramifications and could over time evolve into a partnership matching the scale of Qantas-Emirates. Turkish is a logical bedfellow for SIA as it has the network of a Gulf carrier but is not as aggressive as a head to head competitor. Turkish only operates one daily Istanbul-Singapore flight compared to four (soon five) daily flights from Emirates on Dubai-Singapore. SIA has not yet provided a list of destinations to be covered under the expanded deal with Turkish because implemention, which was initially slated for 1-May-2014, has been delayed pending approval from authorities. After forging the deal with Turkish in Mar-2014 SIA said it is seeking to place its code on Turkish-operated flights beyond Istanbul to unspecified destinations in Africa, Europe, the Middle East and North America while Turkish would add its code on SIA-operated flights beyond Singapore to Southeast Asia and the Southwest Pacific. SIA EVP commercial Mak Swee Wah said during SIA’s 1Q2014 results briefing on 9-May-2014 that the key benefit from the new deal with Turkish is access to Eastern Europe, the Balkans and parts of North Africa. “These are new areas for us, which we have not been able to access previously with our other partners,” Mr Mak pointed out. SIA’s largest European partner is currently Lufthansa, which carries the SQ code to 26 European destinations beyond Frankfurt including 23 destinations that SIA does not serve on its own. Turkish’s European network consists of 97 destinations including 42 outside the Schengen zone. With SIA serving only 13 destinations in Europe including Istanbul, the opportunities are plentiful. SAS is held up as SIA’s strongest European partner as the two have a joint venture; but in terms of codeshare destinations it is smaller than Lufthansa. Currently SAS carries the SQ code on 20 European routes beyond Copenhagen. SIA and SAS began codesharing in late 2010 and entered into a joint venture in 2012 covering the Singapore-Copenhagen route, which SIA increased in Mar-2013 from three to five weekly 777-200ER frequencies. In Aug-2013 the codeshare was expanded to include more European destinations beyond Copenhagen and destinations beyond Singapore in Southeast Asia, Australia and New Zealand. SIA also works with four other European members of Star – Aegean, Brussels Airlines, LOT and SWISS. But these are all very limited partnerships. Aegean, Brussels and LOT do not serve Singapore and the codeshares with SIA simply provide access to Athens, Thessaloniki, Brussels and Warsaw via SIA’s Western European gateways. SIA does not serve Thessaloniki (the second largest city in Greece), Brussels and Warsaw and only serves Athens on a low frequency seasonal basis, including two weekly flights from Jun-2014 to Oct-2014. SIA operates Singapore-Zurich as does SWISS, but unlike the SIA-Lufthansa relationship the two carriers do not codeshare between their hubs. SWISS currently only provides SIA access to five offline destinations in Europe, four of which overlap with destinations served by Lufthansa via Frankfurt. SWISS placed its code on SIA’s Singapore-Zurich service until it launched its own Singapore-Zurich service in May-2013. The inability of the two carriers to expand their relationship as SWISS re-entered the Singapore market is an indication that SIA remains selective in working with carriers that serve Singapore. Of SIA’s 24 codeshare partners (excluding SilkAir) only 11 currently serve Singapore. Only two of these have more than two daily flights in the Singapore market – Garuda Indonesia and Malaysia Airlines, which are generally considered rivals and have limited reciprocal codeshares with SIA on select routes to Indonesia and Malaysia (with no beyond codesharing). Overall SIA now codeshares on over 1,500 weekly flight segments operated by European carriers. Most of these segments cover Western and Central Europe, supplementing SIA’s 11 gateways in Western and Central Europe. Using its Istanbul gateway and Turkish as a link to Eastern Europe is a logical network strategy in line with SIA’s attempt to expand its offline presence globally. An expanded partnership with Transaero would also make sense but Transaero does not provide nearly the depth of Turkish. SIA began working with Transaero in Jul-2011 and the Russian carrier now provides offline access beyond Moscow to four domestic points in Russia while SIA carries Transaero’s code on its Singapore-Moscow-Houston service. Turkish also provides an opportunity for SIA to expand its currently very limited African network. Turkish currently serves 37 destinations in Africa while SIA’s African network is now limited to three (soon two) online destinations and only 11 offline destinations. SIA currently serves Johannesburg, Cape Town and Cairo but on 16-May-2014 announced plans to drop Cairo in Sep-2014. Cairo is now served three times per week as a tag with Dubai. SIA is able to retain Cairo in its network by using its longstanding codeshare with EgyptAir. SIA already puts its code on EgyptAir operated flights between Dubai and Cairo, providing a more economical option than continuing its own Dubai-Cairo service. SIA dropped non-stop service to Cairo several years ago. Singapore Changi has long advocated for the resumption of non-stop service to Cairo. But it is more viable for SIA to serve Cairo on an offline basis, particularly given the continued political instability in Egypt. Meanwhile, EgyptAir is more interested in serving other Southeast Asian destinations that have more local traffic. EgyptAir launched in Apr-2014 Jakarta as its third Southeast Asian destination after Bangkok and Kuala Lumpur. Its selection of Jakarta was disappointing for Changi as Singapore is a Star hub while Jakarta is now a SkyTeam hub but Egypt has greater economic and cultural ties with Indonesia. A non-stop link from Singapore to Addis Ababa would significantly improve SIA’s African connections and Changi’s quest to become a hub in the growing Asia-Africa market. A non-stop service would only be sustainable with a strong partnership (and possibly a joint venture) between SIA and Ethiopian as the local Singapore-Ethiopia market is very small. Banks of connections are required on both ends. Ethiopian and SIA began codesharing in Oct-2011, just prior to Ethiopian’s ascension into Star, via Dubai with SIA operating Singapore-Dubai and Ethiopian operating Dubai-Addis Ababa. In late 2013 SIA began codesharing on Ethiopian’s new Singapore-Bangkok-Addis Ababa service and also on Ethiopian operated flights to six African destinations beyond Addis Ababa: Pointe-Noire in the Republic of the Congo; Mombasa and Nairobi in Kenya; Kigali in Rwanda; Dar es Salaam in Tanzania; and Entebbe in Uganda. SIA added Ethiopian’s code on its flights to four destinations in Australia. There are opportunities for a much wider range of offline destinations in Africa as Ethiopian currently serves 41 international destinations within Africa as well as 15 domestic destinations in Ethiopia, according to OAG data. But it would only be worthwhile adding most of these destinations if Ethiopian (or SIA) were able to operate a non-stop service between Singapore and Addis Ababa. A non-stop from Singapore to Addis Ababa would provide one stop access from Singapore to destinations throughout Africa and a two stop product from Asia-Pacific including Australia. The current two stop and three stop products are not always competitive. SIA’s expanded partnership with Turkish complements the partnership with Ethiopian as Turkish will be able to provide offline access to North Africa that Ethiopian cannot provide. SIA’s longstanding partnership with South African Airways (SAA) is also complementary. SAA now provides access to four domestic points beyond Johannesburg but could also potentially provide SIA with access to regional international destinations within southern Africa. Africa may be a small market from Singapore but it is growing and with the right connections and partnerships SIA could turn Singapore into a hub for Asia-Africa flows. Changi is keen to develop African connections as its growth in its traditional markets is now slowing significantly but without SIA and SIA partnerships this campaign will go nowhere. Changi is also keen to develop connections to Central Asia, which has traditionally been a white spot in the airport’s network. Uzbekistan Airways in Apr-2014 became the first Central Asian carrier to serve Singapore, operating two weekly flights from Tashkent on a circle routing with Kuala Lumpur. Uzbekistan Airways is unlikely to attract SIA but Kazakhstan’s Air Astana has also been looking at Singapore and would be a better potential fit for the Singaporean flag carrier. Air Astana has the largest network of international services within Central Asia, providing Changi and potentially SIA access to a fast growing region. As in the case with Ethiopia, a non-stop service from Almaty to Singapore would not be viable without connections on both ends. SIA currently does not have any offline destinations in Central Asia. SIA could also benefit from a new partnership with a Middle Eastern airline. The carrier’s Middle Eastern network has steadily shrunk in recent years, with Riyadh in Saudi Arabia being the latest destination to be cut. After Riyadh is discontinued in Sep-2014, SIA will only be left with service to Dubai and Jeddah (with Jeddah served as a tag beyond Dubai). Turkish could help SIA build up some offline access to the Middle East but this is not ideal as it involves backtracking from Istanbul. SIA could potentially start working with several Middle Eastern carriers via Dubai. Currently SIA now only codeshares with EgyptAir and Ethiopian at Dubai. Several of the smaller Middle Eastern carriers could potentially provide offline access beyond Dubai, enabling SIA to establish an offline network in the region and compete more effectively against Emirates, Etihad Airways and Qatar Airways. As is the case with Central Asia, SIA currently does not have any offline destinations in the Middle East. For now a major Gulf carrier is not a likely suitor, especially if Turkish is to become a closer partner. But nothing can be ruled out entirely as SIA gradually warms to the concept of relying on other airlines, including former foes, to improve network connectivity. The North American market, which has particularly become a focus for partnerships as SIA has reduced its own footprint in the US, will be looked at in the second in this series of analysis reports on SIA’s partnership strategy. Asiana has recently joined ANA and Virgin Atlantic in providing connections to North America while Turkish and EVA could also potentially provide new options for North America as SIA loses US Airways as a partner. The second part will also look in more detail at SIA's partnerships within Asia.